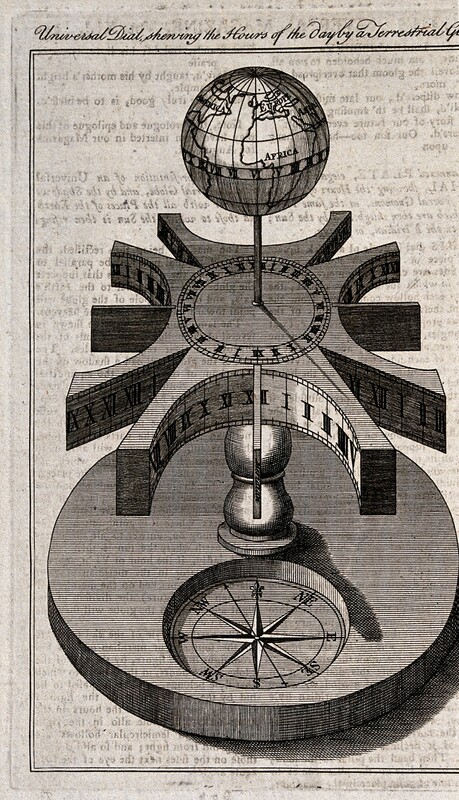 Clocks: a universal sundial, with a compass. Engraving. In Arabic, the word “shimaal” means left, but it also means north – which if you are facing east, makes sense. Similarly, the country Yemen takes its name from “yameen,” which is Arabic for “right.” Yemen is in the southern part of the Arabian peninsula – which of course, when facing east, is on the right. Linguistically, the words “east” and “west” are conceptually linked to the pattern of days – not only in Indo-European languages, but also Semitic languages. “East” comes from an Indo-European root that gave us the Latin “aurora” (dawn). “West” comes from an Indo-European root that gave us the Latin “vesper” (evening). Similarly, “orient” comes from the Latin for “to rise,” while “occident” (an archaic term for the West) comes from the Latin “to cut down,” which describes the movement of the setting sun. In Hebrew, “west” is “ma’arav,” whose root has also given us “erev” – evening – and, yes, a verb related to the setting of the sun/time of day (accounts vary as to whether it is the verb “to mix,” which would refer to the mixing of day and night, or “to enter,” based on early man’s idea that the sun entered a tent to “sleep” every night). So next time you are giving directions, especially on the east-west axis, remember that you are not only referring to a physical place, but also a place in time, and the movement of the sun. And remember, too, that each reference to east and west is also a subtle reminder of the passage of time.